​Christ Church (Methodist& United Reformed Church) is seeking to appoint a Youth Worker with responsibility for setting up and leading a Creative Arts style Youth Club for 12 – 18 year olds. Click the button below to download and application pack. 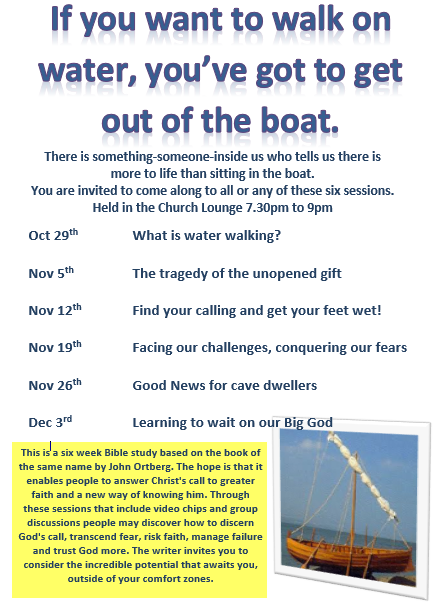 Click here to download the latest notices and Magazine from Christ Church. In September 2018, members from Christ Church undertook a pilgrimage to the Holy Land. Here are Debbie's reflections on the trip. "I don’t think I have ever been, or expected to go, to a place where the three main Abrahamic religions live so closely together, with all their different styles of living and worship. Jerusalem was the most wonderful eye-opener to how history has brought them together. Hassidim (ultra-orthodox Jews) worship side by side with secular Jews at the Western Wall and in their diverse ynagogues; Israeli Arabs and Palestinians may be Muslims or Christians, their styles of dress occasionally denoting their religion through head scarves, but alongside tight jeans. Christians are harder to ‘see’ as most are Palestinians or Armenians who have lived here for hundreds of years, who blend, unless wearing the distinctive robes of monks or nuns. All have many diverse mosques and churches to worship in, the latter having Russian and Greek Orthodox, Catholic and all types of Protestant churches to choose from. To the untrained eye, it would seem that The Holy Land is a place where these religions and peoples live together harmoniously, that they have buried historical differences. The reality is different as we know there are ongoing challenges where land and property are concerned, and especially religious sites. For me, it was the diversity that was fascinating, to be able to walk through places of such massive historical and religious importance, to hear so many different languages spoken, to see so many alternative places of worship openly used at such close quarters. And most of all, to be able to share a time of communion with those I travelled with, especially the wonderful service Pauline gave us beside the beautiful and peaceful Sea of Galilee. I bring home with me an abiding memory of differences on a large scale, but where the people live because, despite the massive daily challenges they may face, this land, and especially Jerusalem, are worth it." 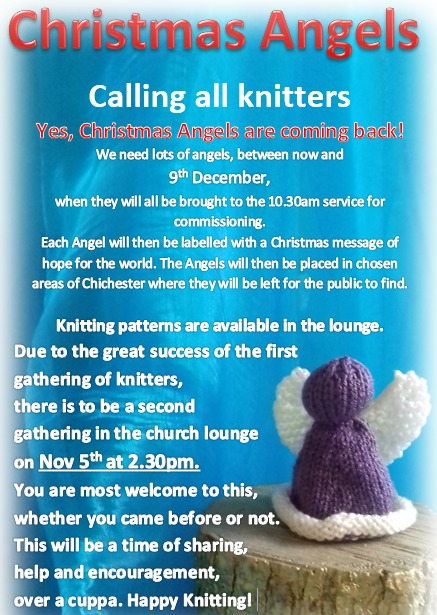 Did you know that Christ Church helps and supports the work of the City Angels? The City Angles come from all walks of life. They are currently drawn from about 7 different churches across Chichester. Every Friday night, and most Saturday nights from 10pm to 2am the City Angels are in the city centre with a team distributing free refreshments from their van located at the bottom of South Street. If you fancy a coffee, tea, hot chocolate or even just seeing a friendly face, please com and say, "hello". If your night does not go quite as you hoped or planned, and you need somewhere to go, please come and find the City Angels so they can help you out. Part of the team also patrol around the city in the evening bringing a smile and looking out for people and just making sure folk are OK.
Click here for to read it now. ​​Starting on Monday 19th February 2018 there will be an Alpha course running at Christ Church. See our What's on page for full details. 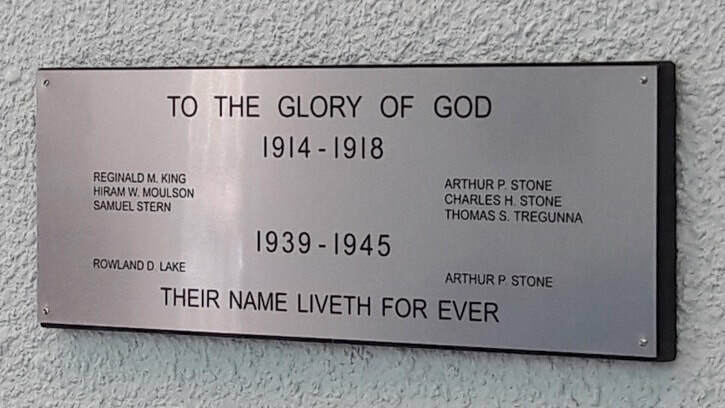 During this year’s remembrance service we were able to unveil our new memorial to those from Christ Church (formally South Gate Methodist church) who gave their lives during World War I and World War II. During the service we remembered those who have fought in all conflicts since 1914.